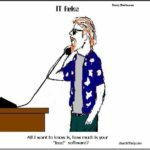 Don't Feed The Geek - Updated every Tue and Thurs, unless I don't. » Too scrawny for the football team, not smart enough for chess club. Don't Feed The Geek – Updated every Tue and Thurs, unless I don't. Too scrawny for the football team, not smart enough for chess club. My Office Was Broken in to. All I want to know is how much is your free software? A few months back, We had a great MRI. Fast forward to Monday (5-13) We had a horrible scan. It showed my main tumor is growing again, and has gotten much bigger. There will have to be s surgery. This gag didn’t happen in real life. but, it was sure going to happen. I came in to my office to several Christmas presents on my desk. Sadly, one of the gift giver cleaned up my desk. Such a violation.